A Peruvian menú blackboard outside a restaurant in Iquitos. Photo by Tony Dunnell. 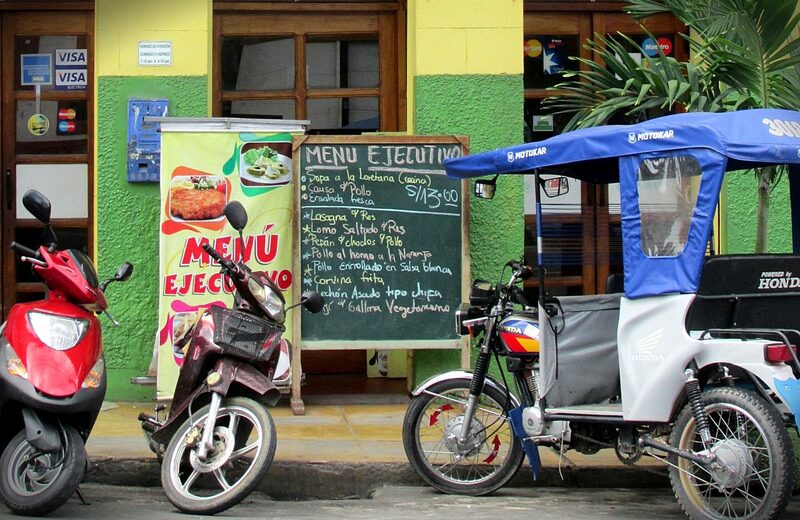 For anyone traveling on a budget, the Peruvian menú can be a wonderful thing. To avoid confusion, you first need to know that the menú in this case refers to the menú del día, or menu of the day. If you want to see the actual à la carte menu in Peru, you ask for la carta. The menú in Peru (as in Spain) is a set-lunch option offered by restaurants of all shapes and sizes across the country. It typically consists of two or three courses, with multiple options for the main course, and a drink, at prices often ranging between S/ 6 and S/ 13 (about $1.80 to $4). Basically, it provides a cheap and filling way to eat lunch each day. And sometimes a menú is tasty as hell: a fine example of what Peruvian food can be. Sometimes, but certainly not always. The typical Peruvian menú is served between midday up until 2 or 3 p.m., with the number of main course options often diminishing the later it gets. What’s on offer varies between regions, but you’ll normally find a few classics like lomo saltado, ají de gallina and escabeche de pollo. The daily options are usually written on a blackboard outside most menú restaurants. 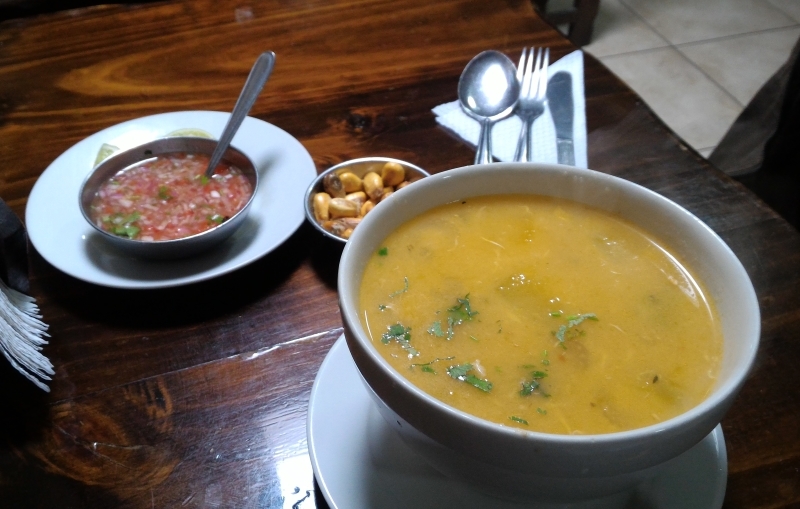 The starter options include some kind of soup (often very good), a salad option (often very dull) and a random extra like papa a la huancaína or ceviche (if you’re on the coast). Dessert, when included, is normally a small wobbly thing that could be jello/jelly. Vegetarians are unlikely to find many options, if any, on most menús. There are some traditional Peruvian dishes that vegetarians can eat, but most of them are starters rather than main courses. That’s a shame for vegetarians, because a good menú is a wonderful thing. Take, for example, one of my favorite restaurants in Peru: Aventuras Marinas in Miraflores, Lima. Aventuras Marinas is a small, slightly dark restaurant whose seafood aroma smacks you in the face when you walk through the door. For S/ 10 to S/ 12, you can eat a fresh, vibrant starter — perhaps ceviche or a chilcano de pescado (fish broth) — followed by one of many main course options, fishy and non-fishy. You also get a drink and a tiny dessert. The quality is the same as you’d find in many touristy restaurants, but for half the prices at least. A menú at a place like Aventuras Marinas, or even somewhere not quite as memorable, is a boon for budget backpackers. It’s cheap, it fills you up, and it introduces you to a wide range of Peruvian dishes — including some of the weirder Peruvian dishes, like the dreaded mondongo, which you might want to avoid. I try to include one good menú restaurant in all my city guides. Apart from cooking in you hostel or living on street food, you won’t find many cheaper options. A soup starter and main course at Aventuras Marinas in Miraflores, Lima, all for S/ 11. Photo by Tony Dunnell. I’ve been exposed to some truly awful menús in Peru. The kind that include an insipid “soup” of water and shards of bone, followed by a mound of poorly cooked white rice with a single, miserable chunk of meat no larger than a well-used human thumb. Thankfully, you can largely avoid menús this bad by following a couple of rules. Unless you’re really down to your last few soles, don’t go for the cheapest menú you see (the price is normally written on the blackboard outside the restaurant). I recommend S/ 8 as a minimum in cities, and maybe as low as S/ 6 in smaller towns. Much less than this and the quality can drop off completely. You’ll see menús for S/ 4 and S/ 5, but they’re normally substandard at best. The second rule is to eat where the locals eat. If it’s between midday and 1 p.m. and a menú restaurant is busy, that’s a great sign. If it’s empty, then you should think about finding somewhere else. While set-lunch menús are a great way to eat in Peru on a budget, you should treat yourself occasionally. 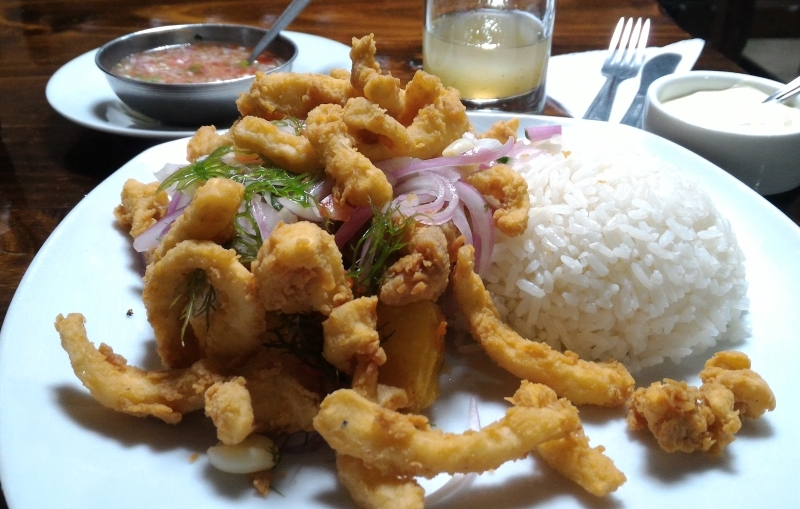 You could easily spend a week or two eating for cheap in Peru and then go home wondering what all the fuss is about: wondering why Peruvian food is receiving such high acclaim. You will find great food in some menú restaurants like Aventuras Marinas. But to consistently experience the best of Peruvian cuisine — and to understand why the culinary world is currently so obsessed with it — you have to treat yourself occasionally and go to a more expensive restaurant with high quality à la carte dishes (see my city guides for recommendations).